A few issues ago I reviewed the latest studio album 'Defying Gravity', by Mr. Big. I nailed my colours firmly to the mast, proclaiming them to by my favourite band, but also stated I felt it was the weakest album they had made to date. I put that down to poor production, the fact the album was effectively written and recorded over a six day period and that there were some fillers as a result of rushing, which was most uncharacteristic for this group. 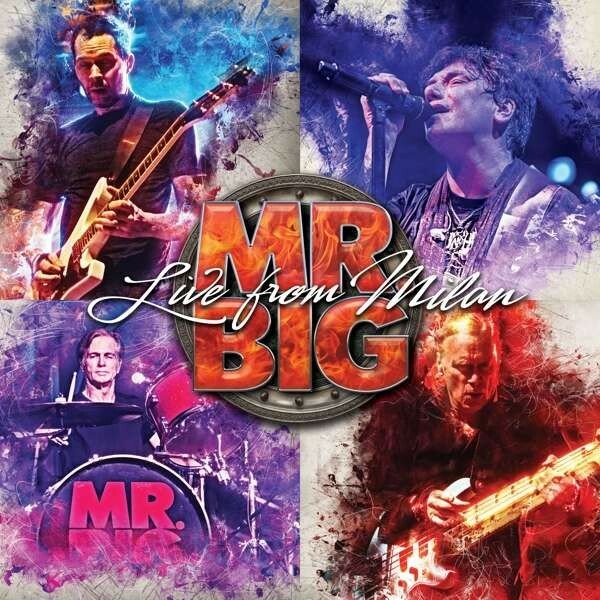 As a live unit Mr. Big are among the elite and that could well be why they have released more live albums than studio efforts, so the announcement that 'Live From Milan' was coming out was a welcome one, as it meant I could own an officially released live recording from every studio album's promotional tour. And with the tragic news that drummer Pat Torpey passed away as a result of complications from Parkinson's disease just a few months after this tour was done, it's even more poignant. The set comes as a double CD and Blu-Ray package with a set list spanning material from six of the seven albums they recorded with Paul Gilbert on guitar – only 2014's '...The Stories We Could Tell' isn't represented here. There's classic tracks aplenty, from 'Daddy Brother Lover Little Boy' to 'Colorado Bulldog', 'Take Cover', 'Addicted To That Rush' and of course 'To Be With You'. These are mixed in with the usual Billy Sheehan and Gilbert solo spots and five songs from the latest album. As a huge fan it pains me to say this, but there are a few drawbacks to this release. Firstly, the usually superb Eric Martin sounds very tired on some of these songs, struggling badly on 'Just Take My Heart' and phoning in the vocal on the thumping 'Around The World'. He also seems increasingly reliant on a breathy falsetto he keeps utilising on certain notes. The second problem is the band's trademark harmonies are not as prominent here in the mix, sounding good when Torpey joins the band for 'Alive And Kicking', low in the mix on 'Green Tinted Sixties Mind' and just downright sloppy on 'Open Your Eyes'. Like the album this tour promotes, I don't think the production is top drawer either, with a lot of emphasis given to Sheehan's distinctive bass playing, which makes it muddier and less punchy than some of the other killer live releases. But those drawbacks aside, there's still much to enjoy here. 'Everybody Needs A Little Trouble' fits in with the older material beautifully and the cheerful 'Damn I'm In Love Again' works well. Unfortunately 'Defying Gravity', which closes the show, sounds flat and lacks energy. Gilbert's playing is, as usual, first class and the same applies to Sheehan, while Matt Starr does a good job on drums filling in for Torpey, although he lacks his predecessor's feel and swing. You can sense a palpable lift when Torpey comes on stage, and that's the most important part about this release. While it's nowhere near as special of some of their other live albums, 'Live From Milan' is a send-off to one of the founding members and a testimony to just how important a part Torpey was to the Mr Big sound.